I didn’t know anything about tinting before I came to this class. I now feel that with a little time getting familiar with “The Process” I will become a great window tinter! Thanks for everything, the overall experience was excellent! I liked the school VERY MUCH and my opinion about the overall experience was positive. We had a lot of fun and I loved all the practice time we received…I just wish there was more!!! 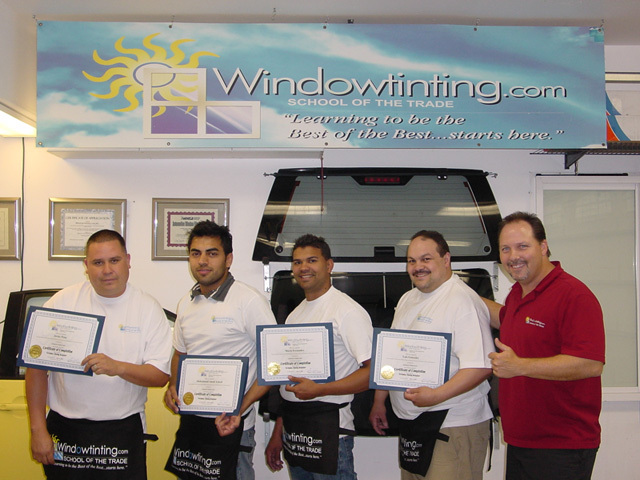 The best experience ever for window tinting training! The personal instructions, location, and training facility were AWESOME! Thank you so much for the opportunity and the knowledge you provided me. P.S. Next time I’ll take two of those delicious sandwiches! The training was excellent, the instructor (Robert) is great and entertaining, and I would do it all over again if I had too. Thank you very much for the knowledge you provided me with…did I say “GREAT INSTRUCTOR”!